Oh, stop being stereotypical; of course it's not true that the Chinese eat anything and everything. This 100% Chinese blogger for one won't even go near stuff like braised dog's meat and snakes' gall bladders - let alone eat them. No doubt some sick gluttons in the Far East do, but they only make up a minute minority. It is therefore unfair to say that we Chinese are blindly indiscriminate when it comes to our choice of foods. Having said that, we do boast a number of lovely cuisines which many Westerners might find, well, "interesting". Here I'll mention a few of them. Mind you, these aren't authentic Malaysian food. Most, if not all, of them are actually recipes from the Far East (mainly China) that have made their way here over the centuries. No doubt one can also easily find them on menus in Chinatowns all over the world. They're seriously delicious... well, at least to the Chinese palate they are. Continue reading, decide for yourself and tell me what you think. 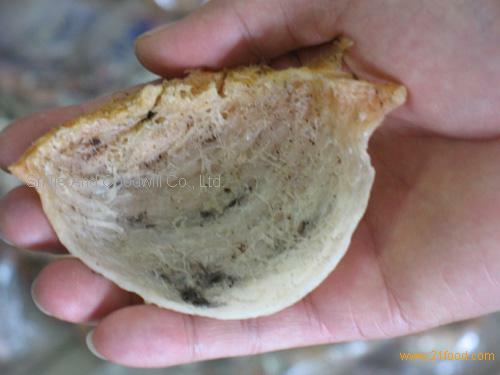 YU PIU (pronounced "yee pew") or fish maw refers to a fish's air bladder that's been extracted, cleaned and sun-dried. In Asia, these bladders (especially those of large fish) are considered a delicacy and are therefore quite expensive - so check the menu price before you order. 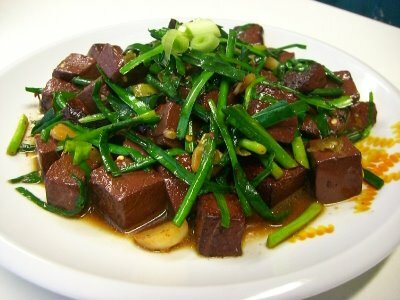 LOU MEI (pronounced "low may") is the Cantonese name given to a dish that's prepared by simmering meats, internal organs, entrails and other leftover parts of animals (such as pig entrails, chicken scraps, duck gizzard as well as pig's tongue and ears) in a soy-based sauce. This sauce or "lou" - which is flavoured with spices such as star anise, cinnamon and cardamom - and the slow simmering process effectively negate any unpleasant smells or taste emanating from the animal innards and scraps - making the dish seriously aromatic and oh-so delicious (the trick is to stay oblivious to what you put into your gob). So essentially how good a lou mei dish tastes really depends on how well the sauce is prepared and how expertly the simmering process is executed. Lou mei can be served either cold or hot. The former is often served with hot lou sauce on the side; whilst hot lou mei is invariably served straight from the pot of lou sauce. Not everyone's cup of tea, but I'm totally at ease with this dish. Want some? Next up, CHU HUNG (pronounced "jee hoong") which is basically pig's blood coagulated into a solid block that feels and looks like your common white tofu or bean curd; save for its dark shade of burgundy, that is. Chu hung is never eaten plain, but rather stir-fried with vegetables (most commonly, chives) or mixed into a congee. It kinda tastes like, well... blood - slightly "metallic" from its iron content, but otherwise without any strong or distinct flavours. In fact, when cooked with other ingredients and sauces, chu hung efficiently absorbs the other flavours and becomes most appealing. Its texture might seem a little unusual at first but quickly grows on you. Compared to tofu, it's more gelatinous; and when bitten on, breaks into distinct chunks - unlike tofu which crumble apart. To the Chinese, consuming pig's blood is considered a cheap, effective way of expelling toxins from the human anatomy; and because of its high cobalt content, chu hung is also believed to nourish one's arteries and keep them supple. Many moons ago, Mom used to cook chu hung dishes every now and then. But late-20th century health awareness (paranoia, I call it) brought with it concerns about the hygiene of chu hung, and as a result, it has - unjustifiably, in my opinion - lost its appeal amongst many Chinese; Mom included. Chu hung is hence far less popular these days compared to the time when people were less paranoid about expiring foodstuff and all that health jazz. God, I miss chu hung! 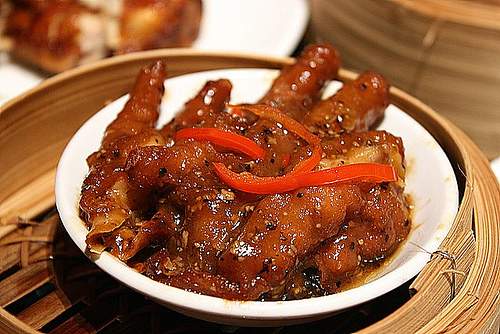 FUNG ZHAO (pronounced "foong jao") or chicken feet are seriously tasty and delicious - if properly done, that is. With literally no meat and being mostly cartilage, fung zhao are extremely gelatinous and are commonly used in Chinese cuisine (they're even served at wedding banquets). The most popular way of cooking fung zhao is dim sum style, i.e. steamed chicken feet that are braised in sweet and salty black bean sauce. Yummy! Prior to cooking however and purely for reasons of hygiene, the outer layer of the skin (it's like a thin membrane) must first be removed and the toenails trimmed. Some - including myself - prefer their fung zhao more "puffy" or less "rubbery" as pictured above. 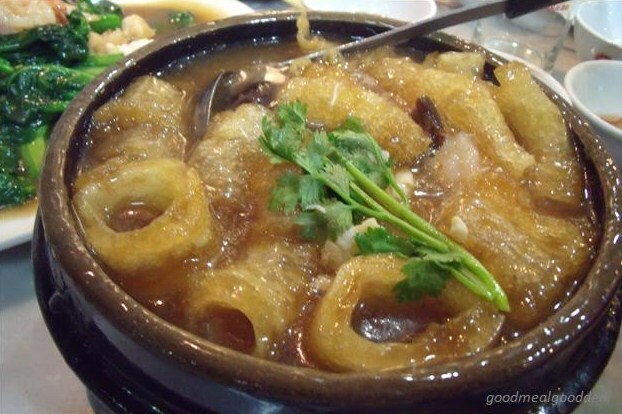 This is done by first deep-frying the chicken feet before braising. And because they are rich in collagen, they're also commonly used to make soups - which probably explains why many Asians look younger than they really are. Now, surely that is reason enough for you to start eating fung zhao, no? Go on.... you know you wanna. Twice featured on TV's "Fear Factor" as a dare to contestants, PEI DAN (pronounced "pay dahn") or century egg a.k.a. preserved egg is a Chinese cuisine ingredient made by preserving duck eggs in a mixture of clay, ash, salt, lime and rice hulls for months at a time. Through this process, the yolk becomes a pale shade of dark green, with a creamy consistency and an odour of ammonia (yes, you read right... ammonia); while the white becomes a flavourless dark brown, translucent jelly. Century eggs are almost always eaten without further preparation - on their own or as a side dish. As an appetizer, we commonly consume chunks of pei dan with slices of pickled ginger... straight. 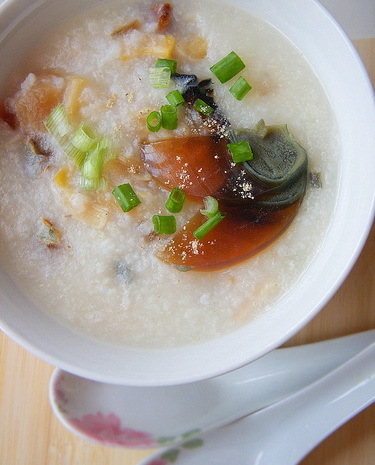 However, they are most often used in making the very popular "pei dan and lean pork congee", where century eggs are cut into small chunks and mixed into the porridge. This recipe can be found in literally every dim sum restaurant; not only here in Malaysia but also around the world. Whichever way they are served, century eggs are absolutely delightful and personally, I love 'em to bits. Pei dan invariably appear unpalatable to most Westerners. And justifiably so. But trust me; they're an acquired taste - albeit one that initially takes some degree of courage. After a while, you'll grow to appreciate them. So as it was on "Fear Factor", I dare you! A bowl of yin wo is both a prized as well as pricey delicacy. This is due to the hazards involved in harvesting the nests and the painstaking manual labour involved in removing impurities such as twigs, feathers and mud (using forceps, mind you). So pricey is bird's nest that a kilogram can command market prices of anything between US$2,000 and US$10,000, depending on their quality; and it is a well-known fact that yin wo ranks among the most expensive edible products in the world. Yin wo is nutrient-rich and is hence believed to provide many health benefits - including aiding digestion, improving the voice, alleviating asthma and improving one's overall well-being. But above all, yin wo is also consumed as an aphrodisiac, especially in the Far East. No doubt they taste better than those off-the-shelf libido-improving pharmaceuticals, I'd imagine. 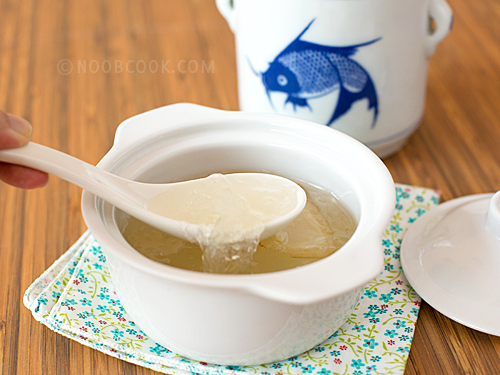 The simplest and most common method of preparing yin wo soup is to simply add water and rock sugar to the cleaned swiftlets' saliva and double-boil the concoction for 2 to 3 hours. Wolfberries and ginseng are sometimes added for taste. 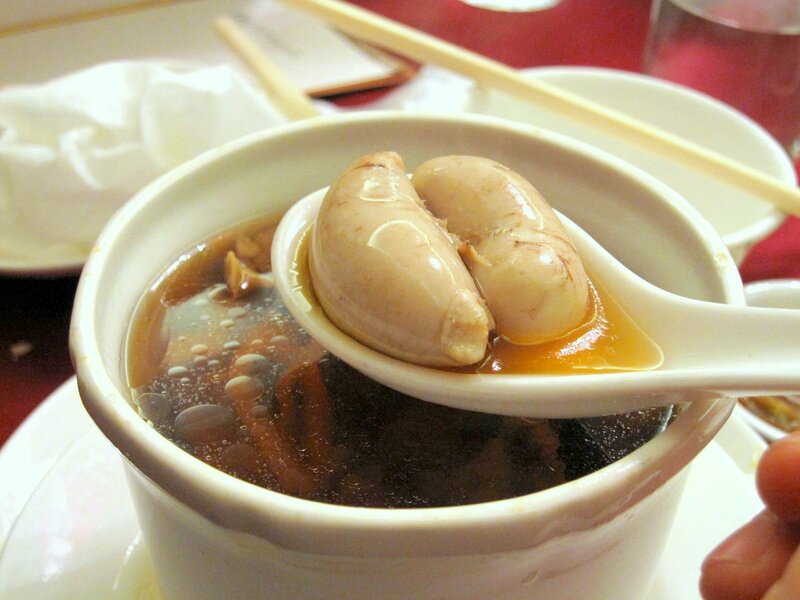 When dissolved in water, the birds' nests take on a gelatinous texture which - together with the sweet soup ("tong sui" in Cantonese) - make for a dessert that is most pleasing to the palate. Actually it's more like heavenly; trust me. So go on... break the bank and enjoy this most delightful of delicacies at least once before you die. Amongst the foodies I've mentioned here, my favourite has to be yin wo or bird's nest because it's absolutely divine. But to consume this on a regular basis is too much of a privilege for this working-class blogger to even consider - never mind afford. Coming in at a close second is fung zhao or chicken feet. I simply adore this dish, especially when served dim sum style with a pot of Chinese pou lei tea on the side to wash it all down with. Cheaper by light-years and easily found in Chinese restaurants, I really don't mind having fung zhao every other day. So tell me; of the six, which do you reckon you'd be most at ease with? Every country, every culture has its own culinary oddities. The English have their black pudding and the Scots their haggis. The Filipinos adore their balut (boiled duck's egg with near-developed embryo); likewise the Japanese their shirako (male fish genitalia with seminal fluid inside). They're all edible; so in the end it's really a question of whether one has the grit to pop the stuff into his or her mouth. So if you're feeling hungry and happen to be in the vicinity of Nelson Street in Liverpool, Leicester Square in London or Lower Manhattan in downtown Noo Yawk, let not your desire for food be wavered by the appearance of or the ingredients used in some of the more "interesting" Chinese foods. As is well-known, our cuisines are amongst the most delicious on the planet... you'll love 'em! Before I take my leave, I'd like to invite you - yes, YOU - to join me for an exotic six-course Chinese dinner complete with entrée, plat principal et dessert. Any takers? I'm guessing not. But is "Yin Wo" as "swallow spit" any worse than honey, which is "bee spit"?